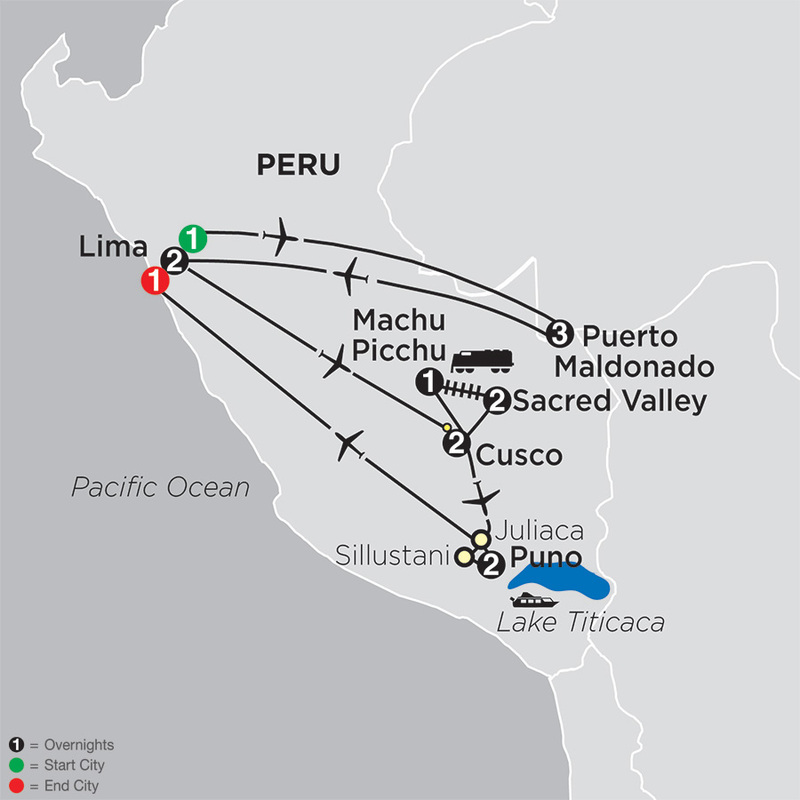 On this Peru tour, delve into the past, learn about the local culture, and experience beautiful scenery as you spend time in Peru's Amazon, Lima, the Sacred Valley, Machu Picchu, Cusco, and Lake Titicaca. Along the way, visit ancient ruins, experience the amazing Amazon, and enjoy guided sightseeing in Peru's fascinating cities. History comes alive on this tour through Peru. Imagine what life was like in the 15th century as you tour the ancient ruins of Machu Picchu, where you'll see this famous Inca complex set in a majestic setting. More history awaits at Ollantaytambo, the archaeological site of the Incas’ resistance during the Spanish conquest, and the Temple of Sacsayhuaman, a fortress with some of the best examples of Inca masonry. Guided sightseeing in Cusco features the Santo Domingo Monastery, where the Inca foundations remain under the Spanish baroque structures, and the Cathedral, housing a magnificent collection of artwork.On this Peru tour, you'll also learn about the local culture. On your motorboat tour of Lake Titicaca, you'll visit Taquile Island, where you'll see how the local people integrate their Inca and Spanish past, and the Uros Floating Islands, where you'll learn how the Uros Indians construct their islands, homes, and boats from totora reed, a centuries-old practice. In the Incan town of Ollantaytambo and in Sillustani, visits with locals in their homes give you insight into their way of life. Spend time at the Indian market in Pisac and in Awanakancha, learn about the importance of camelids (llama, vicuña, alpaca, and guanaco) to Inca culture.But that's not all…you'll also spend time in the Amazon, where you'll enjoy canoe rides and walks in search of the thriving flora and fauna, including turtles, monkeys, and birdlife. Accompanied by knowledgeable Naturalists, you'll appreciate the Amazon both during the day and at night.These are just some of the many highlights of this Peru tour. Designed for savvy, value-minded travelers, it's a vacation of a lifetime! Day 2: LIMA–PUERTO MALDONADO–TAMBOPATA ECO LODGE. Day 3: TAMBOPATA ECO LODGE. Day 4: TAMBOPATA ECO LODGE. Day 9: SACRED VALLEY–MACHU PICCHU. Day 13: PUNO. EXCURSION TO LAKE TITICACA.